Harry Belafonte accepting his award at the Four Seasons Hotel on Friday night. One night after receiving Berklee College of Music’s honorary doctor of music degree, singer-songwriter and activist Harry Belafonte received the Museum of African American History’s Living Legend Award at the Four Seasons Hotel Friday night. The gala honors contemporary leaders who have followed in the footsteps of renowned civil rights pioneers like Frederick Douglass and William Lloyd Garrison, who’s great-grandchildren Frank and Edith Garrison were there to celebrate. 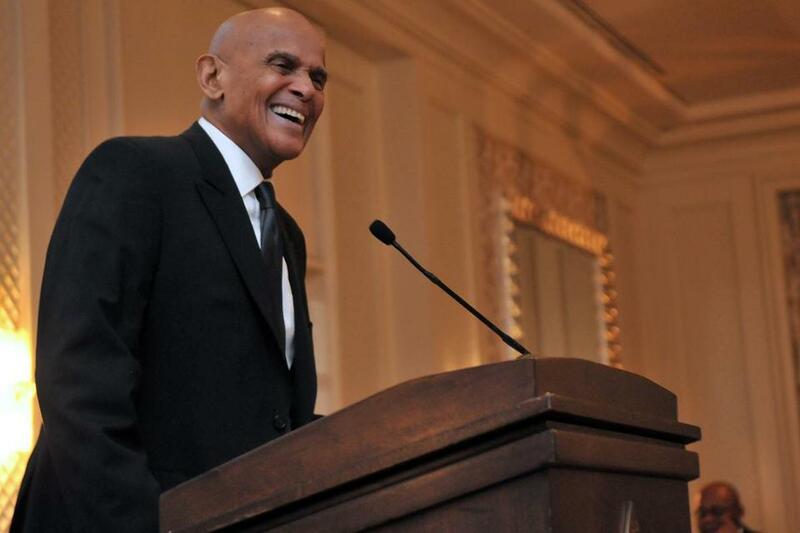 Belafonte’s contributions to the civil rights movement through music and social activism earned him the award, which he received alongside former Mayor Thomas M. Menino and Margaret A. Burnam, the first African-American woman to serve in the Massachusetts judiciary. “As a high school dropout, for me to be around these incredible humans — I am unable to describe how this fortune came my way,” Belafonte said. He said his passion for activism came from his mentor, musician-actor-activist Paul Robeson. “Paul once said, ‘Artists are the gatekeepers of truth, and art is the radical voice of civilization,’ ” said Belafonte, accepting his award. Belafonte announced during the event that he’s been appointed to the board of the Smithsonian’s National Museum of African American History and Culture in Washington, D.C., which is expected to finish construction in 2015.